In a previous post, we noted the popularity of both hydraulic hooklift systems and roll-on cable-hoist loaders for trucks because of their efficiency. 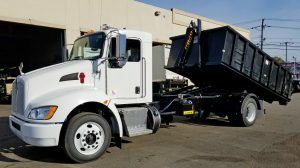 Contractors, scrap metal haulers, municipalities, landscapers and many others recognize the benefits to purchasing one chassis, equipping it with their system of choice, and lifting or rolling on as many different truck bodies as needed. With this lift-on or roll-on capability, a rig that works as leaf vacuum one day can become a sewer jetter the next day, a tanker the following day, and so on. Users don’t add entire trucks to their fleet. Instead, you’ll purchase new bodies as needed — often gaining 100% utilization of your truck. But which system is best? Hook loader proponents will tell you about the faster loading speeds, more pickups-per-day and enhanced safety you get with their systems. Cable hoists users, on the other hand, will cite the greater familiarity that many have with cable hoists. They may note the larger selection of pre-owned cable-hoist equipment on the market as another advantage to their systems. Because of their lower-angle loading/unloading capabilities, cable-hoist systems are more suitable for use at sites with limited overhead clearance. They’re the better choice for placing containers underneath overhead obstructions, in buildings or within other enclosed structures. Hooklift systems are better designed to handle elevated loads such as those on loading docks. Cable hoists can only load from raised platforms if they’re about the same height as the rails on the truck and if the rig can back up flush to the platform. As for unloading on elevated docks, with a cable system you’re out of luck; they don’t have that capability. The best advice? Check out both systems carefully. It may help, too, to refer back to the previous post. Those operating their trucks in tight spaces or in areas requiring straight approaches will find that the advantages go to hook loaders.